There’s the rare discovery, then there’s a spectacularly rare discovery. Recently, paleontologists have unearthed a triple whammy of sorts. Not only did they find a rare prehistoric snake killed and preserved in mid-dinner, they also uncovered a very rare sauropod nest as well as an example of a non-dinosaur preying on a dinosaur. The nest was uncovered in Gurajat, India, by Jeff Wilson of the University of Michigan, Ann Arbor. 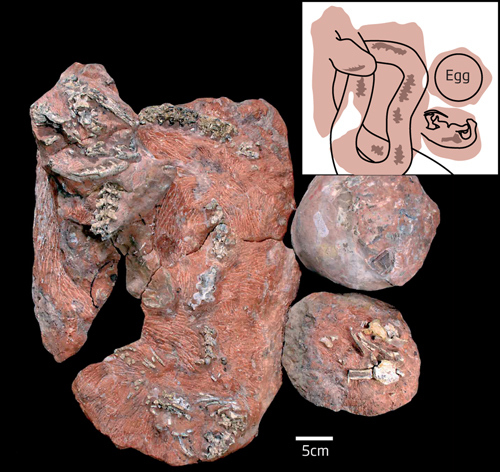 It is believed the whole nest, including the snake and baby sauropod, were buried alive by a landslide at the precise moment the snake was closing in on its dinner. Paleontology seems like the coolest career, doesn’t it? When I was a kid, I thought it’d be the best job in the world. I mean, you get paid to dig up old dinosaur bones; what could be cooler than that? And this was before Jurassic Park came out, making paleontologists into action heroes AND scientists!